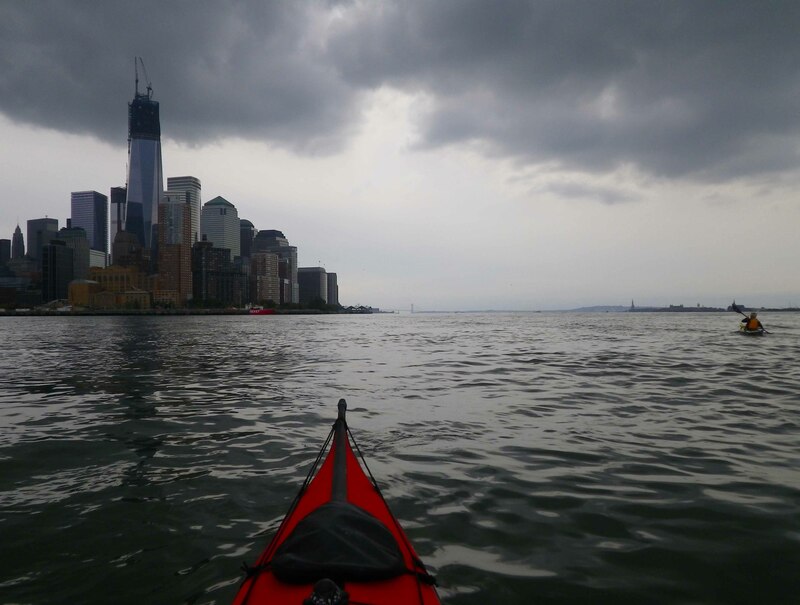 On Saturday, October 27, with Hurricane Sandy just offshore and aiming, it seemed, directly for New York City, we went for what we (correctly) suspected would be our last kayak trip for some time. The individual photos, and a much larger-format slideshow, are here. 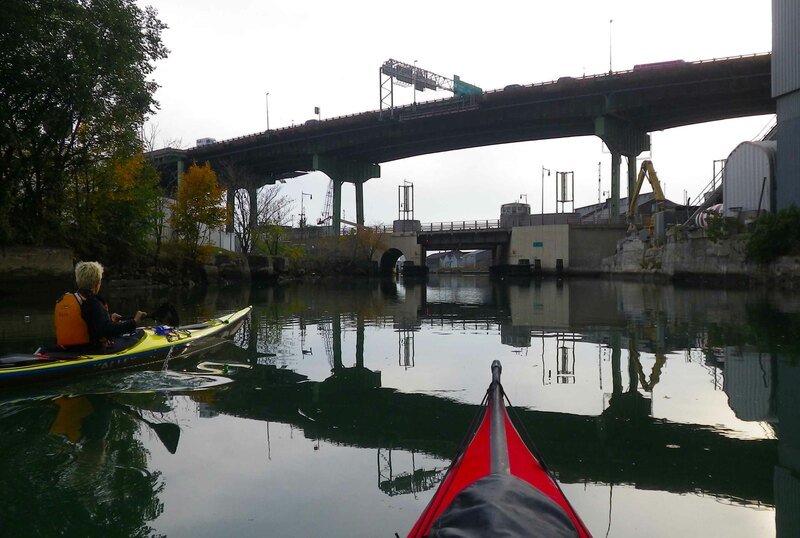 This entry was posted in Kayaking, New York City and tagged Gowanus Canal, Industrial Landscape, New York City, New York Harbor, Photography, Pollution, Sea Kayaking. Bookmark the permalink. I enjoyed watiching your slideshow and like your Red kayak. The New York Grain Terminal building makes me wonder how long it can stand there in its gray ruins. I assume it is empty. 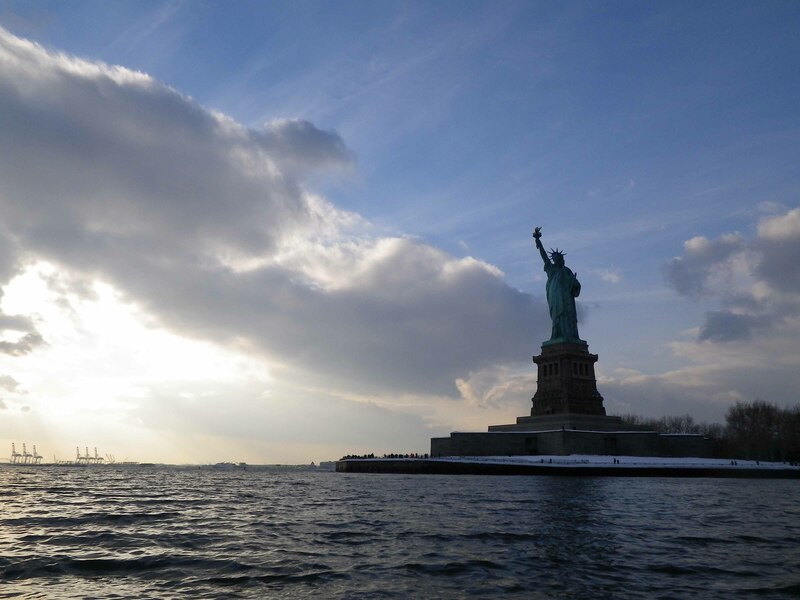 The glimpse of towards the statue, have your photographed that view yet? Fabulous pictures especially the first one with your red kayak! Beautifully done! Love the Slideshow option! love the slideshow and your captions. Like so much else, I think you are right. The Gowanus and Red Hook will never look that way again. I always enjoy what you see when you’re on your jaunts – thanks as always for the lovely photos and stories that go with! Are you concerned going in polluted water like that and having an accident? 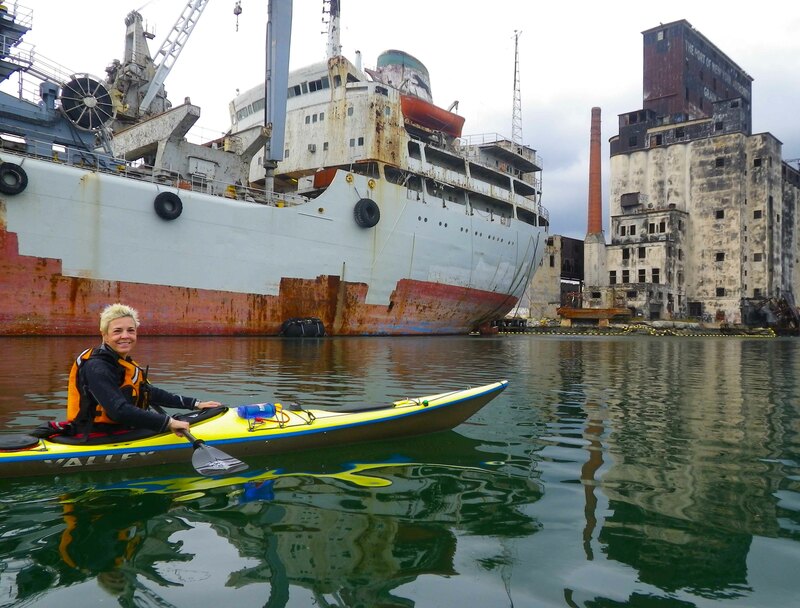 I know kayaking is really safe, but still – you wouldn’t want to overturn in something like that would you? Yeah. . . just trying paddling away and leaving your wife behind. No, I don’t think that would work. Not at all. Ha. The left-behind-one would emerge, coated with slime, having been chemically morphed into a giant fanged creature… take two swift strides through the water, and capsize the other boat…. BWAHAHAHAHAHA!!! Ya’ both made me laugh – those were great! I think the mutant monster is the more likely scenario. It’s like zombies! 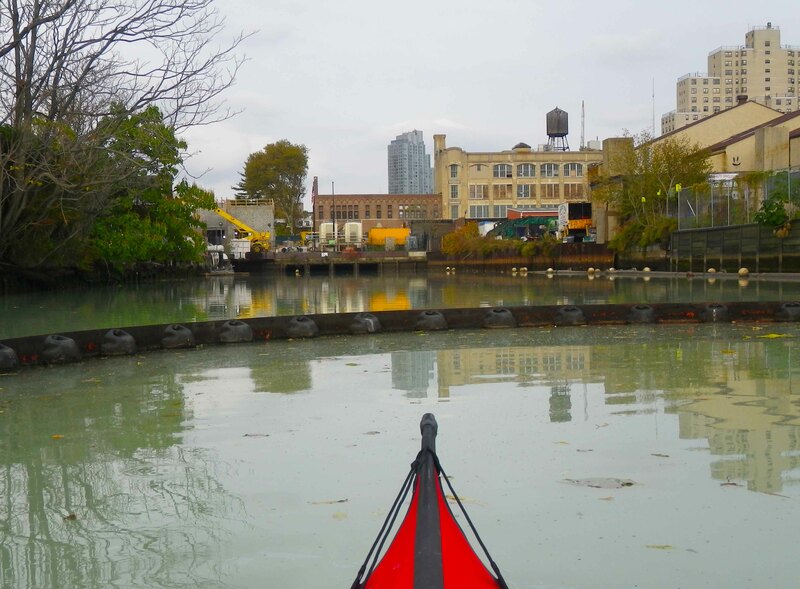 Thanks for the pictures of pre-Sandy Gowanus canal…you must have great memories and pictures to cherish. I like the photos! Great to see the other side of the ocean! I think it is quite true! Fascinating story and photos – I particularly like the first one. 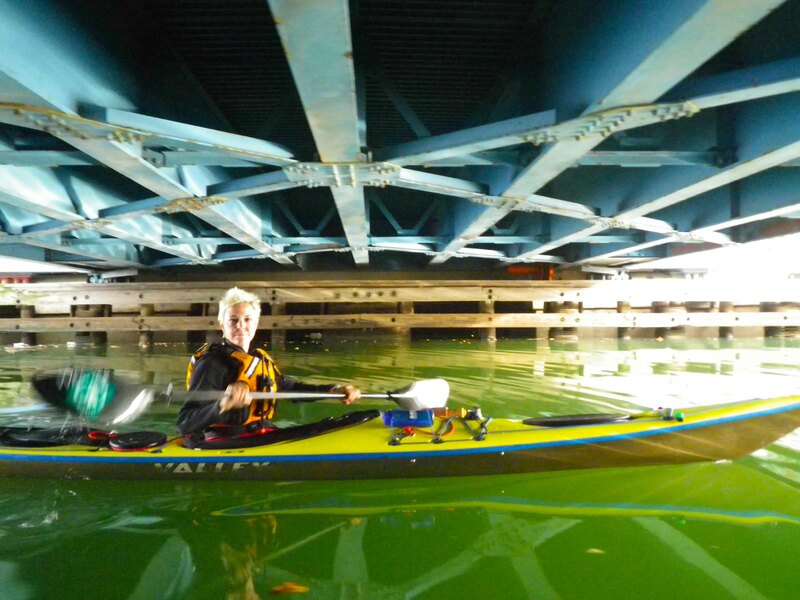 Fascinating post – some shots are reminiscent of the English canal system – ever considered kayaking through England? Having lived in Britain for a number of years, I am reasonably familiar with the English canals—but that was many years before I started kayaking. 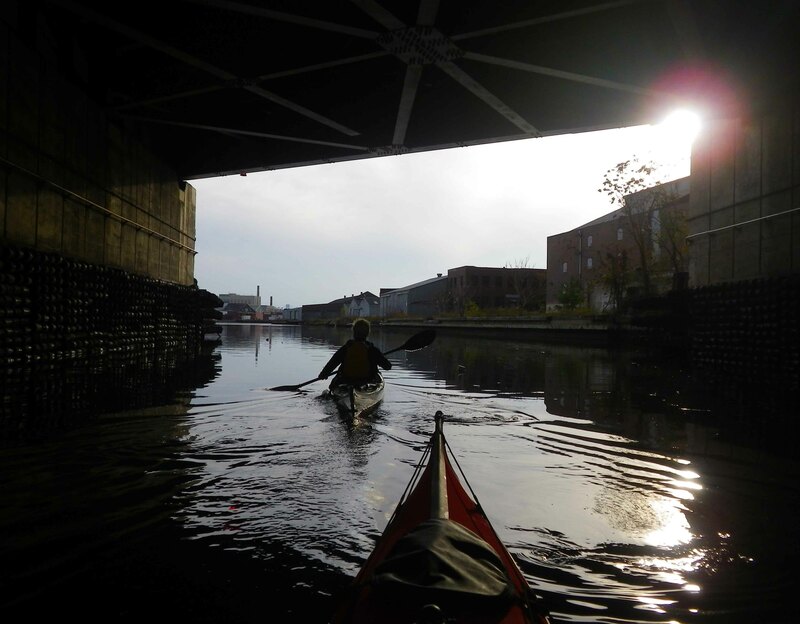 On the whole, after kayaking on lakes, even big lakes such as Lake Champlain, I’ve decided that on the whole I prefer the sea, with tides, currents, and wave action… But going a long way through a canal system has its own special appeal too. I’ve recently come across the Devizes to Westminster canoe race, for instance. A thought for the future? These pictures are wonderful. Hopefully they will not be the last of this beauty. Besides all this and our home being in Sandy’s path, it just continues to amaze me how many facets of all of our lives this hurricane has upset. The list is endless and devastating. Hoping for better days…and grateful for all I still have. I didn’t read all the comments, but I really can’t believe you two did that. That water just looks so…sick. (shudder) But, as you saw, even there life eeks out a living. Did you find out what kind of flowers those were? The abandoned buildings and junk does look apocalyptic – very fitting now, huh? Terrific post. As a lifelong resident of NJ, moving just 12 years ago, I watched with sadness as my friends and relatives dealt with the storm. Your photos offered a very interesting perspective! Thank you! We thought it would be a somewhat different take on things that everyone is writing and reading about… thank you!! I’m so used to kayaking on the New River … I very much enjoyed your pictures of “urban” kayaking. I particularly like the one of the city and the point of your kayak. These images from urban waters never cease to amaze me. Nicely done. A truly monumental blog post (an oxymoronic sounding thing to write but it holds). Of course its not safe to be in that water. It will take a lot of superfunds to clean up that toxic mess. Its like liquid graffiti and much much worse. (I like graffiti for the most part — this wet mess has the fascination of graffiti with the added thrill of being deadly) Its ironic that the city is cleaning up its waterfront (Brooklyn Bridge Park is a great example) just as Nature is declaring it off limits. The city and Long Island will be abandoned and will return to the barrier island status Nature intended for it in a couple of hundred years. (Unless the while thing is put on stilts — that might be easier than relocating everything) I wonder if the River Cafe will be rebuilt? I’m pleased that you are very skilled in the water and didn’t capsize (did you?) because that might finish you off which would be a real tragedy! Stay safe!! No, we didn’t capsize—if we had, the writeup would probably be quite a bit more exciting! Dylan was being metaphorical 50 years ago but now its not a metaphor. I saw a program on television the other day that said some people are proposing the Gowanus Canal be cleaned up and transformed into a canal like the ones in Amsterdam. That’d be a pretty tall order, given the many decades that the Gowanus Canal has been heavily pollluted. 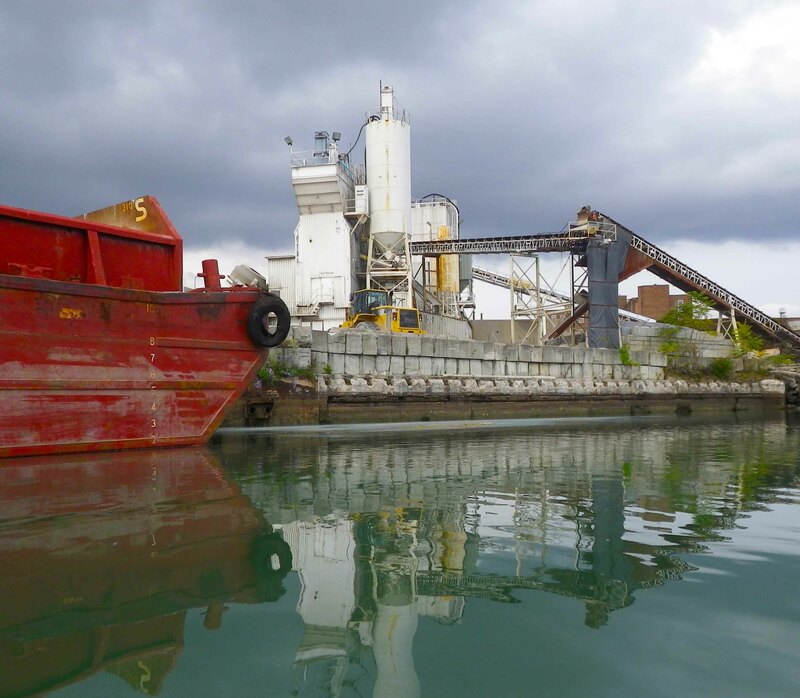 Well, the Gowanus Canal is slated for cleanup—that’s what its Superfund designation means—although how well it can be done, and whether, in this economy, the required money will even be available, is not clear. That first shot is very ominous. That last shot is gives me hope. The glass is always half-full… :-) Let’s hope you are right! Wow, the courage to paddle through those areas. Scary, but great photo ops for sure. I wouldn’t be surprised if you saw bodies floating by… Very interesting series! wow – you are very brave paddling there knowing you could potentially take a swim. Boston Harbor was once a brown murky mess and we managed to clean it up – but it took years. There is always hope and no time like the present to get started. Great photo journalism topic. Be nice if the media would pick this up. And thanks for following our blog!! Very cool, Vladimir. It’s funny the canal actually looks clean. I remember it being very ugly. Did it smell bad when you were there? It’s been at least fifteen years since I walked around in that area and it used to stink. I enjoyed it, though. Love that industrial landscape. You’re right. It is Intriguingly beautiful and ugly at the same time. Love your photos as well as your adventurous spirit. I grew up in Detroit, which taught me to find beauty everywhere. Yet sometimes this same industrial beauty can make me feel sad. Great photos, glad I had a chance to see them. Happy New Year. Thank you, Barbara, and Happy New Year to you! !